38. In the course of the Synod, there was frequent insistence on the need to avoid any antithesis between the ars celebrandi, the art of proper celebration, and the full, active and fruitful participation of all the faithful. The primary way to foster the participation of the People of God in the sacred rite is the proper celebration of the rite itself. The ars celebrandi is the best way to ensure their actuosa participatio. (114) The ars celebrandi is the fruit of faithful adherence to the liturgical norms in all their richness; indeed, for two thousand years this way of celebrating has sustained the faith life of all believers, called to take part in the celebration as the People of God, a royal priesthood, a holy nation (cf. 1 Pet 2:4-5, 9) (115). 39. While it is true that the whole People of God participates in the eucharistic liturgy, a correct ars celebrandi necessarily entails a specific responsibility on the part of those who have received the sacrament of Holy Orders. Bishops, priests, and deacons, each according to his proper rank, must consider the celebration of the liturgy as their principal duty (116). Above all, this is true of the Diocesan Bishop: as “the chief steward of the mysteries of God in the particular Church entrusted to his care, he is the moderator, promoter, and guardian of the whole of its liturgical life” (117). This is essential for the life of the particular Church, not only because communion with the Bishop is required for the lawfulness of every celebration within his territory, but also because he himself is the celebrant par excellence within his Diocese (118). It is his responsibility to ensure unity and harmony in the celebrations taking place in his territory. Consequently the Bishop must be “determined that the priests, the deacons, and the lay Christian faithful grasp ever more deeply the genuine meaning of the rites and liturgical texts, and thereby be led to an active and fruitful celebration of the Eucharist” (119). I would ask that every effort be made to ensure that the liturgies which the Bishop celebrates in his Cathedral are carried out with complete respect for the ars celebrandi, so that they can be considered an example for the entire Diocese (120). 40. Emphasizing the importance of the ars celebrandi also leads to an appreciation of the value of the liturgical norms. (121) The ars celebrandi should foster a sense of the sacred and the use of outward signs which help to cultivate this sense, such as, for example, the harmony of the rite, the liturgical vestments, the furnishings and the sacred space. The eucharistic celebration is enhanced when priests and liturgical leaders are committed to making known the current liturgical texts and norms, making available the great riches found in the General Instruction of the Roman Missal and the Order of Readings for Mass. Perhaps we take it for granted that our ecclesial communities already know and appreciate these resources, but this is not always the case. These texts contain riches which have preserved and expressed the faith and experience of the People of God over its two-thousand-year history. Equally important for a correct ars celebrandi is an attentiveness to the various kinds of language that the liturgy employs: words and music, gestures and silence, movement, the liturgical colours of the vestments. By its very nature the liturgy operates on different levels of communication which enable it to engage the whole human person. The simplicity of its gestures and the sobriety of its orderly sequence of signs communicate and inspire more than any contrived and inappropriate additions. 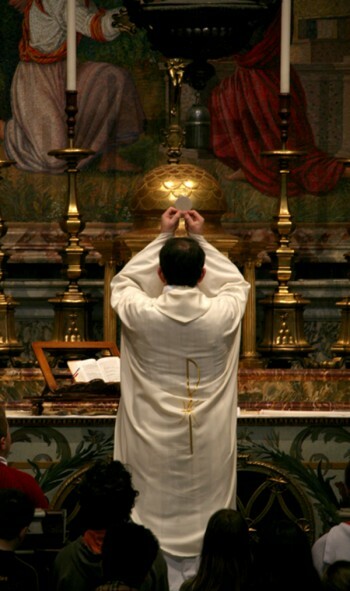 Attentiveness and fidelity to the specific structure of the rite express both a recognition of the nature of Eucharist as a gift and, on the part of the minister, a docile openness to receiving this ineffable gift. 41. The profound connection between beauty and the liturgy should make us attentive to every work of art placed at the service of the celebration. (122) Certainly an important element of sacred art is church architecture, (123) which should highlight the unity of the furnishings of the sanctuary, such as the altar, the crucifix, the tabernacle, the ambo and the celebrant’s chair. Here it is important to remember that the purpose of sacred architecture is to offer the Church a fitting space for the celebration of the mysteries of faith, especially the Eucharist. (124) The very nature of a Christian church is defined by the liturgy, which is an assembly of the faithful (ecclesia) who are the living stones of the Church (cf. 1 Pet 2:5). This same principle holds true for sacred art in general, especially painting and sculpture, where religious iconography should be directed to sacramental mystagogy. A solid knowledge of the history of sacred art can be advantageous for those responsible for commissioning artists and architects to create works of art for the liturgy. Consequently it is essential that the education of seminarians and priests include the study of art history, with special reference to sacred buildings and the corresponding liturgical norms. Everything related to the Eucharist should be marked by beauty. Special respect and care must also be given to the vestments, the furnishings and the sacred vessels, so that by their harmonious and orderly arrangement they will foster awe for the mystery of God, manifest the unity of the faith and strengthen devotion (125). 42. In the ars celebrandi, liturgical song has a pre-eminent place. (126) Saint Augustine rightly says in a famous sermon that “the new man sings a new song. Singing is an expression of joy and, if we consider the matter, an expression of love” (127). The People of God assembled for the liturgy sings the praises of God. In the course of her two-thousand-year history, the Church has created, and still creates, music and songs which represent a rich patrimony of faith and love. This heritage must not be lost. Certainly as far as the liturgy is concerned, we cannot say that one song is as good as another. Generic improvisation or the introduction of musical genres which fail to respect the meaning of the liturgy should be avoided. As an element of the liturgy, song should be well integrated into the overall celebration (128). Consequently everything – texts, music, execution – ought to correspond to the meaning of the mystery being celebrated, the structure of the rite and the liturgical seasons (129). 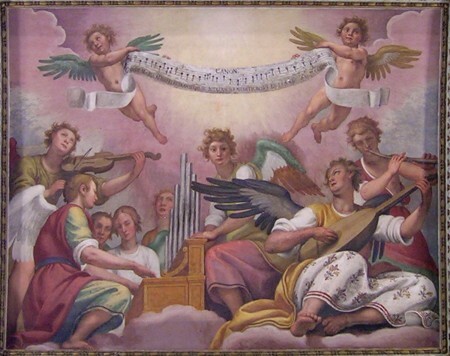 Finally, while respecting various styles and different and highly praiseworthy traditions, I desire, in accordance with the request advanced by the Synod Fathers, that Gregorian chant be suitably esteemed and employed (130) as the chant proper to the Roman liturgy (131). 67. With the Synod Assembly, therefore, I heartily recommend to the Church’s pastors and to the People of God the practice of eucharistic adoration, both individually and in community. (194) Great benefit would ensue from a suitable catechesis explaining the importance of this act of worship, which enables the faithful to experience the liturgical celebration more fully and more fruitfully. Wherever possible, it would be appropriate, especially in densely populated areas, to set aside specific churches or oratories for perpetual adoration. I also recommend that, in their catechetical training, and especially in their preparation for First Holy Communion, children be taught the meaning and the beauty of spending time with Jesus, and helped to cultivate a sense of awe before his presence in the Eucharist. Here I would like to express appreciation and support for all those Institutes of Consecrated Life whose members dedicate a significant amount of time to eucharistic adoration. In this way they give us an example of lives shaped by the Lord’s real presence. I would also like to encourage those associations of the faithful and confraternities specifically devoted to eucharistic adoration; they serve as a leaven of contemplation for the whole Church and a summons to individuals and communities to place Christ at the centre of their lives. 69. In considering the importance of eucharistic reservation and adoration, and reverence for the sacrament of Christ’s sacrifice, the Synod of Bishops also discussed the question of the proper placement of the tabernacle in our churches. (196) The correct positioning of the tabernacle contributes to the recognition of Christ’s real presence in the Blessed Sacrament. Therefore, the place where the eucharistic species are reserved, marked by a sanctuary lamp, should be readily visible to everyone entering the church. It is therefore necessary to take into account the building’s architecture: in churches which do not have a Blessed Sacrament chapel, and where the high altar with its tabernacle is still in place, it is appropriate to continue to use this structure for the reservation and adoration of the Eucharist, taking care not to place the celebrant’s chair in front of it. In new churches, it is good to position the Blessed Sacrament chapel close to the sanctuary; where this is not possible, it is preferable to locate the tabernacle in the sanctuary, in a sufficiently elevated place, at the centre of the apse area, or in another place where it will be equally conspicuous. Attention to these considerations will lend dignity to the tabernacle, which must always be cared for, also from an artistic standpoint. Obviously it is necessary to follow the provisions of the General Instruction of the Roman Missal in this regard. (197) In any event, final judgment on these matters belongs to the Diocesan Bishop.